I am renting my apartment out, and for that I need to calculate the Net Present Value of the rental payment, after deducting the management fees (f) and adjusted for rental increased. What is the formula that I can use in Google Spreadsheet, to calculate Net Present Value of the rental payment, after deducting the management fees and adjusted for rental increased? but inflation means the NPV is lower. 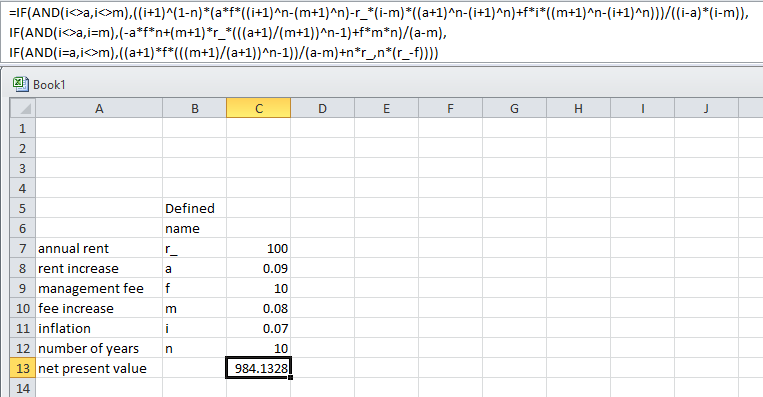 To handle cases where i = a and/or i = m the formulas below can be used. Not the answer you're looking for? Browse other questions tagged investing rental-property rent or ask your own question.